She received a marriage proposal only one week ago, and it's unclear if she accepted. 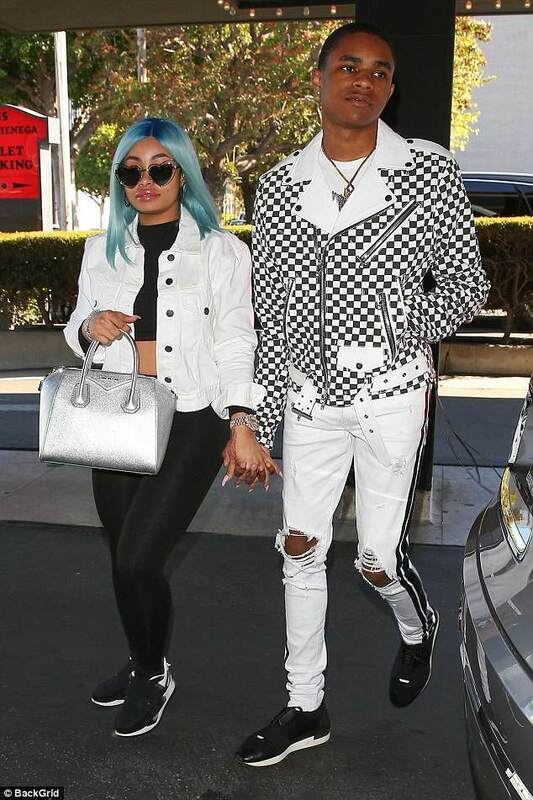 But Blac Chyna seemed completely carefree as she stopped by a nail salon in Calabasas on Friday. The 29-year-old former fiance of Rob Kardashian opted to flash her curvaceous gams while out and about thanks to a thigh-skimming black dress. She layered a jacket with multiple children's cartoon characters emblazoned on the back and sleeves over the dress, though failed to properly wear the cozy coat, instead letting it slide to her elbows. Black socks and some outrageous pink platform boots with several buckles completed her eclectic look. Accessories included a medium-sized silver purse, a tan ball cap and gold-framed shades with rose-hued lenses. The beauty maven seemed to have embraced natural-looking make-up and a dash of pale rose lipstick. One thing she didn't show off was an engagement ring, casting doubt on whether she is actually engaged. On April 10 YBN Almighty Jay posed her with a heavy question on Instagram. 'Will You Marry Me?' the 18-year-old rap artist wrote in a caption along a shot of the 29-year-old reality star. The Texas-based performer, whose real name is Jay Bradley, has been linked with the Lashed owner since February. It is not known if the proposal was a joke and Chyna has not been seen with an engagement ring since. YBN Almighty Jay established himself as an emerging talent with a single called Chopsticks that's racked up more than 10 million YouTube views. It's also garnered him media recognition from outlets including Complex, XXL and Hot New Hip Hop. Blac - whose real name is Angela Renée White - shares co-parenting responsibilities of her one-year-old daughter Dream with ex-beau Rob Kardashian.